Ice cream has some significant meaning to me because my husband proposed to me on my 30th birthday at a local ice cream parlor. Sadly, the ice cream parlor, Sweet Occassions, is no longer in business, but we'll always have memories of the days we took a stroll and enjoyed countless ice cream cones during the spring and summer months. One flavor my husband always ordered was Root Beer Float. This flavor was a 'special edition' that only was available at random times. I'll never forget how he would eagerly look through the ice cream offerings and see if his flavor was there. Most times, it wasn't and he had to settle for something else. Well, now he doesn't have to wait for Root Beer Float ice cream because I was able to make it from scratch! In fact, he said that my version was even more flavorful and had a more defined root beer flavor that the one at the ice cream parlor. To make this flavor, I used my trusty Ben & Jerry's ice cream recipe book and prepared their French Vanilla ice cream. I added some root beer extract and voila... root beer ice cream is born. The vanilla extract gives the right amount of sweetness and mimics the vanilla ice cream used in a traditional float while the root beer extract provides a good amount of flavor and color. Together, it's just like a root beer float all rolled in up creamy goodness! You can find root beer extract at most places... even Walmart! Otherwise, check into specialty online sites like Amazon.com. Pour in the cream, milk, and extracts and whisk to blend. How funny! my sister were just craving for Root Beer Floats! You make your own Ice Cream! NICE! Oh my gosh you just made my day!! Sounds incredible I must try this ASAP!!! I love root beer! I am going to be cleaning out my freezer this weekend to make room for bowl after seeing this...it looks amazing. Oh my gosh, that's awesome! I've never had root beer float ice cream before! 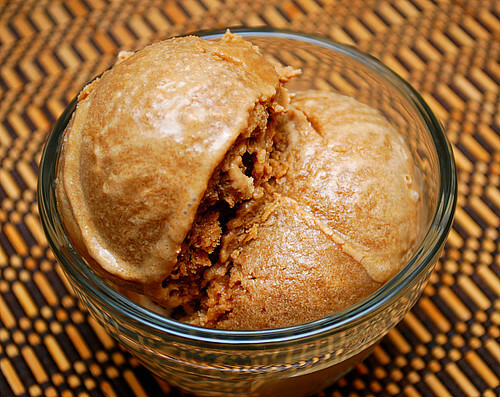 I never had thought of root beer float ice cream! I'll definitely be trying this one out this summer.